This morning I read some sad news on Facebook. Mary McKnight passed away on Christmas Eve. What happened? Had she been sick? Was this sudden and shocking to her fiancé, Mr. Hatfield? How old was Mary? Did she have any kids? Where did she live? What did she do for a living? As I started to put the pieces together, I remember that I begin interacting with Mary in 2008. At the time, she was a leading authority on internet marketing of real estate. We exchanged a few tweets and connected on Facebook, LinkedIn and obviously Twitter, but I quickly realized that I didn’t really know her as more than a provider of great content. As Internet marketers, we measure relationships by subscribers, clicks, views, follows, fans, opens, and any a host of other objective measures. We dehumanize our relationships as we measure the success of our content. Let me clarify: I have a tendency to dehumanize relationships, yet I genuinely value relationships. So, why do I rely on numbers to gauge these relationships? In this digital world, these numbers tell us something, but they don’t really tell the whole story. In a thirty-minute, real-life conversation with someone, you can discover a breadth of information. The give and take of conversation allows far broader context than the public interaction in social media. Few people manage to weave rich, real-world relationships with their online friends. Mark Schaefer stands out as a social icon that maintains a large social network yet builds deep, personal relationships with his online friends. When I die, I want to leave more than a momentary content void. As a friend recently told me, “don’t invest too much in things that don’t matter because those efforts are like pulling your hand out of a bucket of water. Once it’s gone, the water fills the void immediately.” Instead, I long to invest in long term relationships. Using the same analogy, I want to add plaster to that mix, so that when you pull your arm out, it leaves a lasting impression. 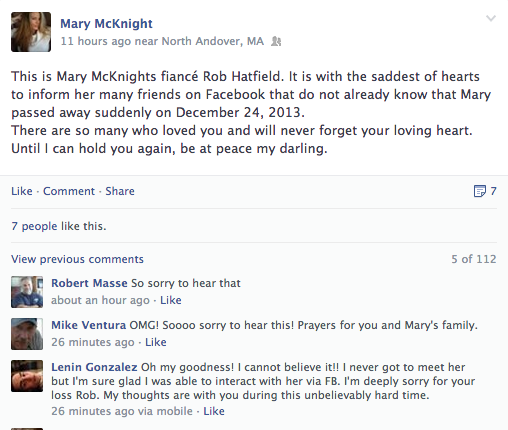 To those that knew Mary well, may you be comforted in this time of loss. For those who don’t, may we invest deeply in those around us. We don’t know the day or the hour, but we do have today.